Modern laboratories can require regulated temperature, humidity, relative static pressure, air motion, air cleanliness, sound and exhaust. The function n of a laboratory is important in determining the appropriate HVAC system selection and design. Air handling, hydronic, control, life-safety and heating and cooling systems may be required to function as a unit and not as independent systems. Labs frequently use 100% outdoor air, which broadens the range of conditions to which the system must respond. Because laboratory HVAC systems often incorporate 100% outdoor air systems, the selection of design parameters has a substantial effect on capacity, first cost and operating costs. The selection of proper and prudent design conditions, and the incorporation of energy recovery, is very important. 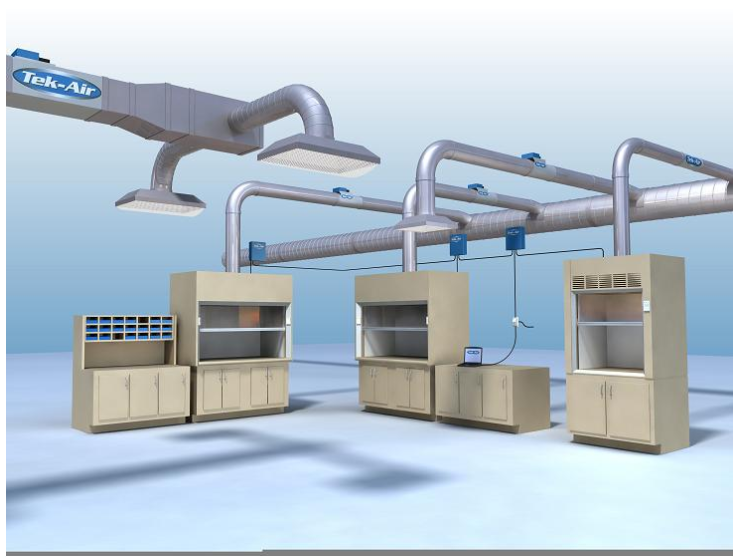 Laboratory exhaust systems remove air from contaminated devices and from the lab itself. The exhaust must be controlled and coordinated with the supply air system to maintain correct pressurization. Improperly designed exhaust systems that ineffectively discharge high concentrations of effluent can result in re-entrainment of the hazardous or noxious exhaust into the buildingmake-up air conditioning system, contaminating the fresh building air. In applications where the exhaust is heavier than air and also corrosive, the use of high plume fans effectively displace theexhaust away from the building roofing system and other roof mounted equipment, eliminating costly corrosion caused by the exhausted vapors. Tall exhaust stacks: Usually architects do not like tall stacks as they are difficult to incorporate into an architectural design. Moreover, they typically require guy-wires and additional bracing due to wind loading forces. High Plume Dilution Exhaust Systems: These systems are designed to have high discharge velocities and dilution by inducing fresh air through the stack. A combination of volume and velocity contributes to a high plume exhaust while diluting hazardous exhaust concentrations.